Golfing in Maui, Kauai, Oahu and Hawaii. 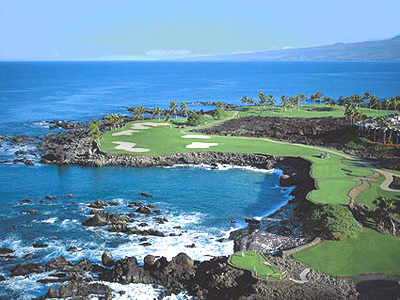 The Hawaiian Islands are truly a golfer’s paradise. The islands almost seem to be made for golf, with ideal weather year-round, fertile soils for growing the greenest of turf grass, and unmatched scenery and natural terrain features. The islands are rich with golf courses. Many are fun and relaxing, some are tougher, and a few will challenge even the best golfers. In fact, Oahu is home to America’s toughest golf course, The Koolau Golf Club is carved out of a tropical rain forest and is framed by magnificent towering cliffs. For golfers looking for a more relaxing experience, the Garden Isle of Kauai, being Hawaii’s outermost major island, is a great golf destination. Less people means more time playing and less time waiting. Many of these golf courses are attached to or located near spectacular resorts, which are destinations in themselves. With large swimming pools, jacuzzis, tennis courts, gyms, multiple restaurants, hotels and condos, and of course ocean beaches, the golf resorts of the Hawaiian Islands are a great place to base your next dream golf vacation.